Let me say this upfront: Buffy the Vampire Slayer Season 2 Episode 2 is an episode I like to skip during my rewatches. Some people like it; I personally don't. That's not to say it's a terrible episode. The plot never hooked me or seemed essential to the story. Still, we're sharing in this experience together and I promised to rewatch it all with you. (If you love it, tell me why!) Let's jump into rewatching "Some Assembly Required". Angel was so jealous of Xander. He had no reason to because, and let's be honest with ourselves, Angel overshadows Xander all day every day. It's cute that Buffy admitted she did everything in Buffy the Vampire Slayer Season 2 Episode 1 was just to make him jealous. Her plan worked. Even as a century-old vampire, Angel fell for the same bait. Dating mind games never change. These two acted like an old married couple after the way they bickered in the cemetery. Obviously it'll never come to that, since he's a vampire and their relationship goes belly up pretty soon. Angel: Of Xander? Please. He's just a kid. Buffy: Is it because I danced with him? Angel: “Danced with” is a pretty loose term. “Mated with” might be a little closer. Buffy: Don't you think you're being a little unfair? It was one little dance which I only did to make you crazy, by the way. Behold my success. Angel: I am not jealous. Buffy: You're not jealous? What, vampires don't get jealous? Angel: See? Whenever we fight you always bring up the vampire thing. Buffy: Well, I didn’t come here to fight. Buffy: Oh, right, I did. Permalink: “Danced with” is a pretty loose term. “Mated with” might be a little closer. I didn't realize Giles was this shy to ask Jenny out. It's like looking at a different character. Giles grows to become a much more confident and cooler character as the series progresses after Buffy the Vampire Slayer Season 2 Episode 2. He was willing to make tough decisions that Buffy could not, like murder someone. Something like asking someone out should not be a big deal to him. The vast difference watching him again at this early point is surprising to see. It's hilarious that everyone is well aware of his crush on Jenny. After rewatching their three episodes together, it's obvious they have major chemistry as actors and characters. Good for him for taking the plunge. Though, I like seeing Jenny be the one to ask him out. If we had waited for Giles, it never would have happened. He was too shy to do anything. One of the reasons I ship Giles and Jenny is because she always pushes him out of his comfort-zone. 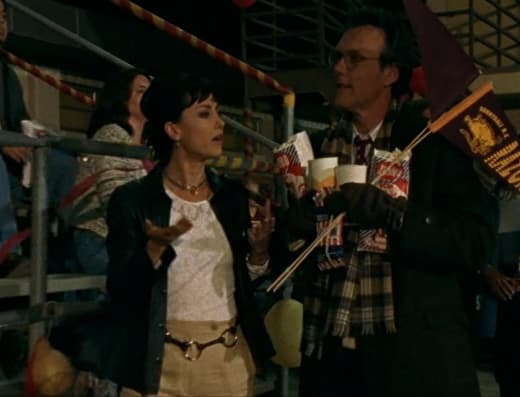 I mean, she had their first date at the Sunnydale High football game! This setting was so anti-Giles and not something he'd do, but he did it for her. Rewatching them together always brings on the feels. Why did Chris and Willow never get together? Looking back at it now, they would've made a cute couple. They're both awkward, they love science, and they have nerdy inside jokes only they would understand. Calling it now that this was a missed opportunity. Xander: You know, this might go a lot faster if you femmes actually picked up a shovel, too. Buffy: Sorry, but I'm an old-fashioned gal. I was raised to believe that men dig up the corpses and the women have the babies. Permalink: Sorry, but I'm an old-fashioned gal. Sure, I understand this is a 90s show and times have changed since Xander's bro-centric writing. However, these cutting comments irritate me every time. Buffy and Willow become two of the strongest characters on Buffy the Vampire Slayer. They don't need to dig a grave if they don't want to. They're perfection. Cordelia ends up being the target a lot on Buffy the Vampire Slayer. Like...A LOT. Has anyone noticed this? Buffy, as the Slayer, seeks out trouble, but it usually finds Cordelia. It's no wonder she eventually becomes close friends with the Scoobies. From the amount of time she needs them to save her, their friendship developed naturally. There were at least three times in "Some Assembly Required" where Cordelia was (nearly) kidnapped. I can't wait until the episodes where she stands up and fights the enemies. Her character eventually becomes a self-sufficient person who can defend herself. It feels more aligned to who she was on the spin-off, Angel. Though, the scene of her finding the severed hand is so funny. It's a classic Cordelia moment. I forgot Cordelia was obsessed with Angel! She's clinging onto his arm so tightly. She was not going to let go for anyone. Poor Buffy...she looked so heartbroken and worried seeing Cordelia on Angel's arm. It's strange to think this initial relationship idea would soon play a big part in the future on Angel. The unintentional foreshadowing is strong with Buffy the Vampire Slayer Season 2 Episode 2. Angel: What I saw didn't add up to three whole girls. I think they kept some parts. Buffy: Could this get yuckier? Willow: They probably kept the other parts to eat. Permalink: They probably kept the other parts to eat. 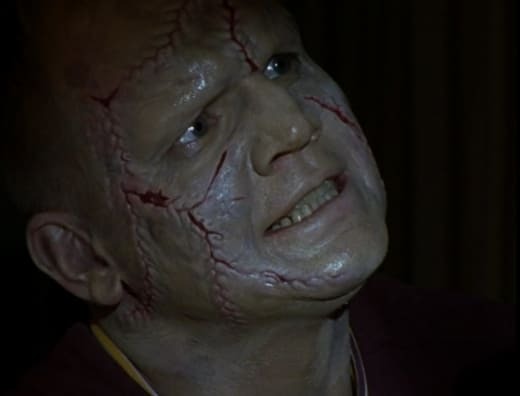 "Some Assembly Required" was Buffy's version of the Frankenstein horror villain. All the items were there: digging up bodies, someone being brought back from the dead, and a bride for the dead man. It all makes sense. We're talking about a series that tackled Dracula on Buffy the Vampire Slayer Season 5 Episode 1. A Frankenstein-like Monster of the Week isn't out of the question. Maybe one of the reasons why I'm not a big fan could be due to the villain? A zombie Frankenstein is pretty tame in comparison to everything else we've seen. And the backstory wasn't interesting. Was Darryl Epps really that important to Cordelia? We never heard about him before "Some Assembly Required". Cordelia has dated other people before, and we've seen one of them die too. It unfortunately felt more like a forced plot device than anything else. And don't even get me started on the makeup. His face looks like grey rubber. Is this due to the experiment of bringing him back to life? The zombies on Buffy the Vampire Slayer Season 3 Episode 2 look more natural as reanimated corpses than Darryl. Cordelia: Darn, I have cheerleader practice tonight. Boy, I wish I knew you were gonna be digging up dead people sooner, I would've canceled. Xander: All right, but if you come across the army of zombies, can you page us before they eat your flesh? Giles: Zombies don't eat the flesh of the living. Xander: Yeah, I knew that. But did you see the look on her face? Permalink: Zombies don't eat the flesh of the living. Chris, Eric and Darryl were easy villains to defeat. It's like they didn't put up any fight. I like that Chris came to his senses. Sometimes we forget these villains can be turned to the side of good. We saw this almost happen on Buffy the Vampire Slayer Season 1 Episode 8 (if Fritz hadn't had killed him). But, it did happen here. Eric, on the other hand, is a creepy guy. I hope he got arrested for grave-robbing. Everything about him screamed red warning signs. He looked like he was itching to create a corpse bride for himself. Similar to Mary Shelley's Frankenstein, I do feel somewhat sad for Darryl. He didn't ask to be reanimated. His brother loved him enough to bring him back and he was forced to live this new life. He only wanted to share it with someone, which is understandable. At least he and his "bride" will be together forever as ashes. His push, on the other hand, to want to kill people to make it happen is not an excuse. He was being selfish and psychotic. He's a villain for a reason. My sympathy goes right out the door every time I remember this. Cordelia and Xander have their first tease of relationship at the end of Buffy the Vampire Slayer Season 2 Episode 2. I think this moment is where she started to see him in a different light. He was the hero who saved her life. His bravery impressed her. Though...I've said it before and I will say it again, he is not good enough for Cordelia. Him dismissing her is just another reason why. He doesn't deserve the queen. Add this scene to the list against him. Xander: Do you mind? We're talking here. So, where were we? Xander: Yeah. So, why do you think that is? Permalink: Wondering why we never get dates. Buffy and Angel end on a real tender moment. They're pretty cute together when they have these serene scenes where they are honest with each other. It's almost like the writers wanted to give us hope. If you're new to this rewatch, I think I should warn you that things will get rough as Buffy the Vampire Slayer Season 2 progresses. Buffy and Angel's romance will take a sharp turn. It will get bloody. It will get scary. And a lot of evil will be coming our way. But, for now, we can enjoy the simpler moments of her walking him home at night. What did you think of "Some Assembly Required"? Would you take your first date to a football game? Was this the first time we saw Angel and Buffy being super romantic with each other? Want to join us in rewatching Buffy the Vampire Slayer? We'll be posting new rewatch posts every Tuesday and Thursday. Come back here and share your thoughts of the episode in the comments.